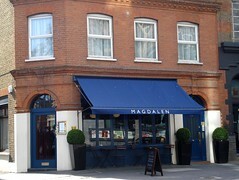 Magdalen was a very good Modern European restaurant on Tooley Street, near London Bridge Station. It closed down in early 2017. As of September 2017 the premises are occupied by a Mexican restaurant called Santo Remedio. Very good Modern European restaurant on Tooley Street, near London Bridge Station. The restaurant is split over two levels, and both upstairs and downstairs are further divided into two rooms. The walls are painted a deep red and the lights are kept dim, so it all feels quite intimate. The menu is meat-heavy, with no vegetarian dishes included at all; although it does state that they are available "on request", and Ewan had no problem getting a vegetarian option on his visit. However, there seem to be a few comments on the interweb that suggest this isn't always the case, so it would definitely be best to check in advance. The wine list is extensive, with a very even spread of prices, starting at £14/bottle and going up for quite some way in increments of £1-2. Also, five reds, six whites, and one rose (all in the sub-£32 part of the list) are available by the half-bottle carafe, costing exactly half the price of the full bottle. There's a choice of three ports (although realistically only two unless you can justify a bottle for £145). RGLers have visited here on a number of occasions, and we have no hesitation in recommending it, even if you need to cross London to get here. Kake first visited lateish on a Wednesday evening in September 2007, in the company of Moray. We hadn't expected it to be too busy midweek, but there were a number of people waiting for a table when we arrived. Luckily the staff managed to find us a table for two almost straight away, I think because the other parties waiting were larger. We were seated upstairs; there was a good buzz of conversation going on around us, but not to the extent where we had trouble hearing each other speak. I started with pigeon terrine with apple and celeriac remoulade (£6.50); this was really rather nice, with a good, varied texture. Moray chose the salt cod with chickpeas and swiss chard (£7.50). Next up was confit duck leg with hispi cabbage and mustard sauce (£13.50) — competent and plentiful — and mixed fried veal offal with lentils, garlic, and parsley (£16). The final bill for two starters, two mains, a bottle of still water and a bottle and a half of wine came to £85.50 — half food, half drinks. Service wasn't included so we rounded it up to £100 and considered it money well spent. Although the place was pretty much full to capacity, service was very efficient (without being brusque) and perceptive to the point where I occasionally suspected telepathy. Helpful, too; when I expressed my liking for the Chateau Grand Village Bordeaux Blanc that we shared a carafe of, our waiter went and found the name of the supplier for me. Ewan and friend visited on a Friday lunchtime in April 2008. We'd booked in advance, though as it was a late lunch, the place wasn't completely packed. Service was friendly and approachable, a carafe of tap water was brought swiftly over on request, and bread placed unbidden after we'd ordered. I had a starter of white asparagus soup with hazelnut, which was really lovely photo. My companion's frogs' legs went down well as well, with a particularly nice garlicky accompaniment photo. Her main was rabbit, but as a vegetarian I requested the "available on request" option which turned out to be more like a breakfast (fried egg with spinach and mushrooms, on toast) photo. It was, in any case, absolutely perfect: a beautifully fried egg, nicely runny, with the best mushrooms I've had on the side. My dessert of apple and cinnamon tart with vanilla ice cream was likewise a beautifully presented and tasty creation, which makes me think that what Magdalen do well is not inventing wild and interesting combinations, but in doing really well some more familiar dishes. My friend's cheese board came with three British cheeses - one a blue cheese, one a cheddar and one a goat's cheese - and all three were sublime, really well-chosen, and fairly large chunks of each. The wine we chose (a Montepulciano d'Abbruzzo) went down very well, and at £9 for a half-bottle carafe, it was good value too. Finally, to settle the problem of pronunciation, the lady who took our booking pronounced it "MAG-da-len" (and not "maudlin" or anything else one might say). bob visited on a Saturday evening in September 2008, in the company of Kake. There was no problem finding us a table for two; we were seated downstairs and it was probably about half full there. I was very pleased with the food; my oxtail ragu starter (£8.50) was fantastic, and I think people should go just for that. My main of roast middlewhite (£17) was also very good, the crackling especially so. The cheeseboard again was very good. Service was friendly and efficient. Kake also tried a bit of bob's starter and thought it was great; the meat was falling-apart tender, the sauce had a very good flavour, and the accompanying polenta worked well. My own starter was potted crab (£8.50) photo, which came with some good sourdough toast and was perfectly fine - it's just that bob's was outstanding. My main was also good; wild sea bass with mussels, clams, and sea spinach (£18.50) photo. I've now had two very good meals here and will happily come back for more. True, this place is less than half an hour's walk from my house, but I would happily travel a good deal further. Accessibility: There's a step up to get in, possibly a bit higher than would be comfortable in a wheelchair, but they have a proper accessible toilet (which also doubles as the ground-floor ladies' — there's another ladies' upstairs though I think). Last visited by Kake and bob, September 2008. Last edited 2017-09-22 16:26:00 (version 33; diff). List all versions. Page last edited 2017-09-22 16:26:00 (version 33).